Everyone loves the taste of a home-made meal but in our busy world, there’s not enough time. The solution to this dilemma is our Caramel Braising Sauce. We have taken the traditional Vietnamese Caramel Braising recipe and bottled it just for you. The ingredients are specially blended so all you need is your favorite meat, seafood, veggies or tofu. It’s quick and easy to use, but dinner will taste like it took all day to make! 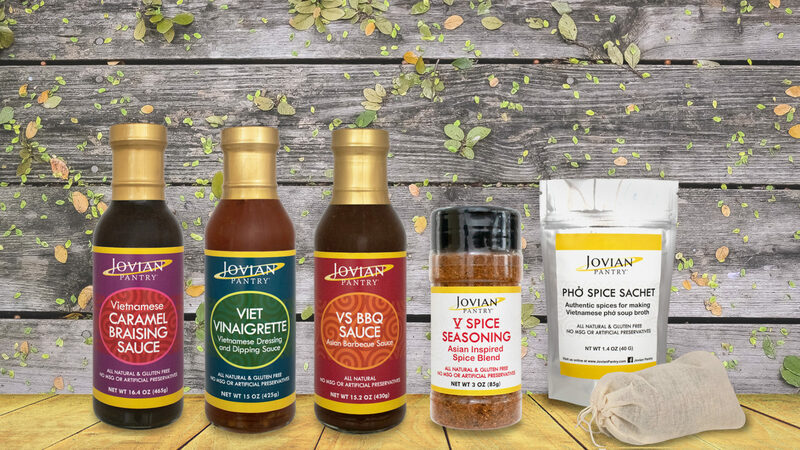 Jovian Pantry® Viet Vinaigrette is our take on the traditional Vietnamese prepared fish sauce used for dipping and finishing. The savoriness of fish sauce, the zestiness of lemon, the sweetness of cane sugar, and a kiss of heat with chilies all meld together for a deep, complex flavor. Use it as a low-fat dressing for vegetable dishes and salads, or as a marinade for meats and seafood. Try it as a dipping sauce for spring rolls or chicken wings. Our Viet Vinaigrette will give your dishes a burst of tangy, savory flavor filled with umami! This is not your typical barbecue sauce. Our VS BBQ Sauce has the smokey, warm flavors of our house blended five spice, balanced with layers of sweet and savory for an aromatic culinary sensation. Great for roasting, grilling, or even as a dipping sauce. Switch it out in recipes that call for regular barbecue sauce for an exciting twist to your everyday meals! Jovian Pantry® Phở Spice Sachet is made with an authentic mix of premium whole spices that are critical to making a delicious Phở broth. No longer will you have to traverse the elements to visit your local Vietnamese restaurant every time you crave the warmth and comfort of this dish. With our Phở Spice Sachet, you can make your own Phở at home and enjoy it anytime you want! Jovian Pantry® V Spice Seasoning is made to be used on anything and everything. Rub for your favorite protein before roasting or grilling, or add it to grilled or sauteed veggies for an extra kick. Made with our house five spice blend, our seasoning will add warmth and complexity to any dish!